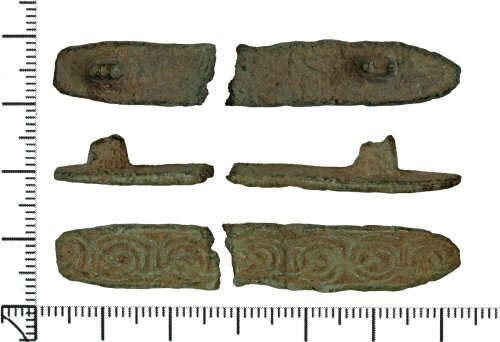 A broken and incomplete copper alloy mount or strap fitting of Early Medieval date.The mount is elongate and sub-rectangular with one rounded end and the other broken. It has a rectangular cross section. The front of the plate is decorated with a moulded interlace design forming seven sub-circular knots set in a framing ridge around the edge of the plate. On the reverse are the stubs of two pierced lugs, possibly for attachment through a leather strap. The mount is broken in two.